Sign up for the Health e-Hints Newsletter! This is a sponsored post brought to you by Nationwide Children’s Hospital. All opinions are my own. You’ve heard me talking about some of the awesome things that Nationwide Children’s hospital has available for families and patients alike. There is so much you can learn just by visiting their website including whether or not to take your child to an emergency room or an urgent care. However, Nationwide Children’s Hospital has made another option for you: all you have to do is check your email. Have you signed up for the Health e-Hints Newsletter? Nationwide Children’s Hospital has a Health e-Hints Newsletter that you can customize to your child’s age. Can you imagine email’s specific to your daughter or son? The health e-hints are written by pediatric experts to make sure you get the correct information you need. Each email is delivered monthly to your inbox. And of course, the emails are free. 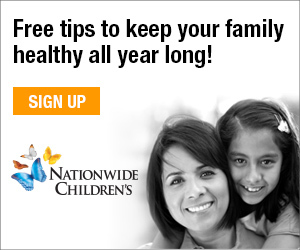 Sign up today to get your monthly email from Nationwide Children’s hospital. I know I already did! Have you thought about choosing your Energy Provider?